Competition, 2014. Project licensed to municipality. In collab with Kika Rypáková, Mark Balzar and Zeynep Aksoz. We discover a city through fortuitous encounters with its spaces, gradu- ally layering newly perceived images on top of memories. But unlike a metaphor of memory, where newest impressions of a space, or of an object, would coexist with a fading remembrance of its previous impressions, the city is different: buildings that are consecutive in history can- not coexist in the same space. Slow change occurs, minor interventions improve major disturbances, or become replaced for another trial. 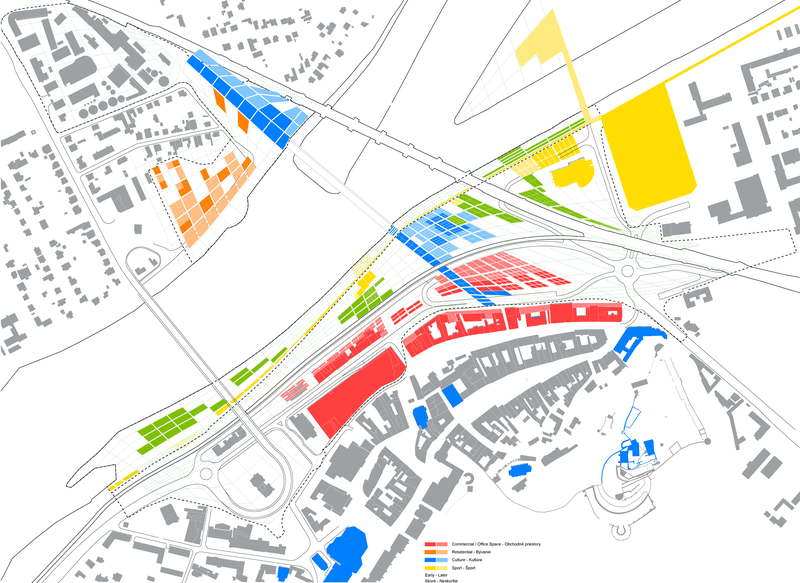 of these neighbouring areas, our intention is not to propose a definitive project, but a variational approach for the connection of Trenčín with its riverfront. Instead of a futile attempt to ape the medieval city formally, or to superimpose an abstract modernist grid on the project area, we propose to link the urban and natural poles of the site through an artificial topography, and thus introducing the scale of landscape urbanism. This topography incorporates two major qualities: it negotiates the in- fluence of surrounding elements by creating a geometrical force field, and it shows the potential of programmatic adaptation and redistribu- tion by providing an abstract system of gradient subdivisions. 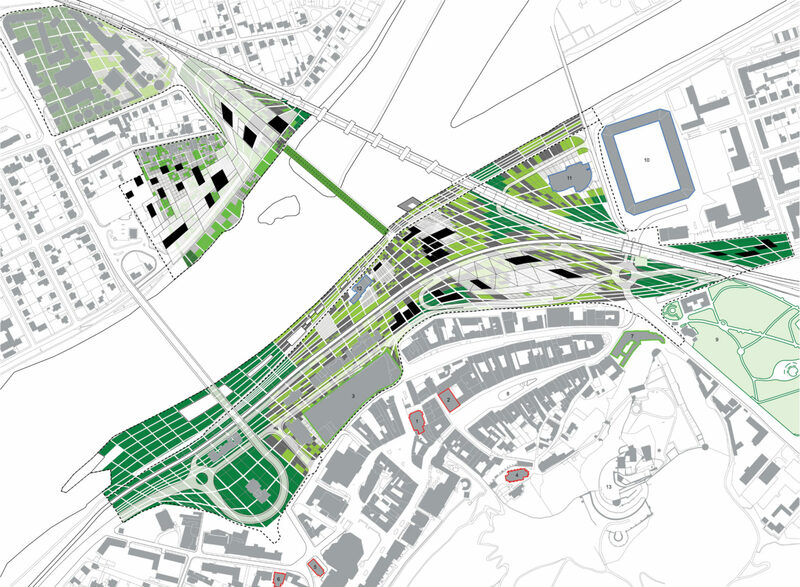 Is also acts as its own metaphor, helping to create a mental understand- ing of the area: it is literally a landscape of different cultivated fields establishing links between various surrounding conditions such as the bridge, the synagogue, the old city entrance in plan, while leveling off height differences between the bridge, the river, the dam, the railway and the city in section. The deformed grid permits various occupations of its meshes. They can be left abandoned, rented out, cultivated, developed or scraped again. It is in fact an adaptive checkerboard for the opening of Trenčín’s urban game, to which our project provides the rules. 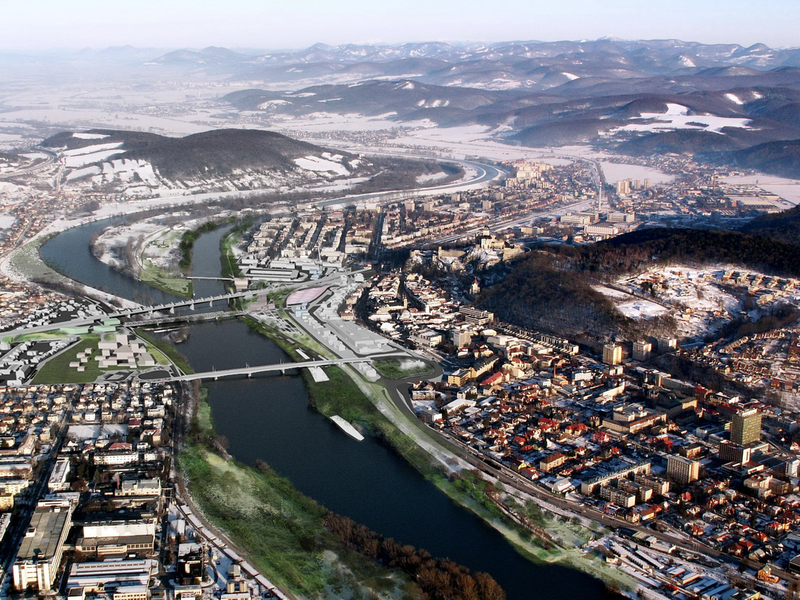 They sollicit the involve- ment of Trenčín’s inhabitants in creating a diverse but enticing river- front. We provide the framework for a gradual cultivation of the landscape, its becoming a connective tissue, with programmatic grafts providing addi- tional connections in time and linking the network of existing elevated pathways of the dam, the pedestrian bridge and the local rail track, pro- viding amazing views towards the river and the city.